The Kahl Company is a Wilmington, Delaware manufacturer’s representative company. Kahl primary expertise areas are industrial and pollution control equipment and process optimization. Kahl has been in this business since 1966. Kahl provides custom engineered equipment to specific client specifications and customer requirements. The company focuses on large projects, maintenance events, and tough to solve process challenges. Kahl was founded in 1966 by Lou Kahl. The company has had a proud history of strong relationships with both principals and customers, some of which have lasted the full 50 years. The key tenants of the company have been engineering excellence, execution strength, and integrity, since the start. These continue to be the fundamentals of the business. With over 50 years in the process equipment business, the company has literally hundreds of thousands of projects completed, and an incredible resource of project history, to support plants and customers. Jim, a graduate of the US Naval Academy, spent much of his career in high tech executive level management prior to joining Kahl. He has an education background in naval engineering, what he describes as ‘afloat process engineering.’ Jim joined the board of the Kahl in 2001 and became principal ownership partner in 2013. Beyond Jim and Lou, the Kahl’s customer facing team includes Sales Engineer, Ryan Mowers, Sales Operations Manager, Cindy Ellis, and Marketing Research Associate, Christine Char. Like many industries, Kahl’s is one that is rapidly changing. Considering the many expansions, closures, mergers, and acquisitions that have taken place in the Kahl region, change is the norm. The Kahl business is structured to understand and provide engineering value in this dyn amic environment. In Kahl’s US Middle Atlantic region, plant and equipment aging is a big factor with few new plants being built and existing plants dating back to the 1940’s, 1950’s, and 1960’s needing close support and attention. Structure to support this dynamic is vital to success. 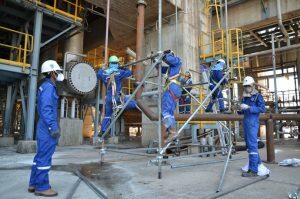 This means the focus is on upgrading and maintaining aging equipment while taking into account the needs and plans of the plant. In the recent years, the two key drivers have been (1) keep the plant running (maintenance, replacement, service, and parts) and (2) stay ahead of environmental requirements. Both of these goals can be costly, and many plants have difficulty choosing between which two to invest their capital. Kahl is positioned to add value in both categories, often bringing synergy between the two. Given the fact that Kahl has often instrumental in providing original equipment, Kahl is often called when it’s time to update, upgrade, or simply maintain the plant. Jim has continued the practices that built Kahl; integrity, dedication to quality engineering, providing outstanding customer solutions, meticulous record keeping, and keen focus on customers. Knowledgeable engineering resource is the starting point. Having an expert customer facing team ready to jump in fast is vital both from a customer and principal perspective. For customers, additional expertise, clarifies the picture, and speeds things forward, and lightens the load. For principals, getting the picture right and presented expertly make the difference in time and success rate. Kahl is dedicated to keeping strong team on and ready, expertly serving customers and principals. Behind the scenes, in recent years Kahl has focused on reengineering the business to the cloud and virtual environment. This infrastructure investment is seen as vital to keep pace with customer requirements, meet principal expectations, and efficiently deliver expertise to the market. With the reengineering effort largely complete, Kahl is positioned and ready to serve. A key differentiator in the business is the capability to manage and support over 1000 clients, with 50 years of project history, in a relatively small geography. SalesForce CRM coupled with an internally developed project tracking and historical access tool provide the team with immediate access to the information necessary serve the customer quickly and effectively. Jim observes that aging engineering resources in plants, refineries, and consulting engineering firms is the top long term challenge in the region. Kahl fills a vital role in understanding existing equipment, and processes, in the plants as people change. Jim observes, “A good day is when a customer calls looking to understand the workings of a piece of equipment installed in 1970, or before. This is when we really shine.” Kahl’s capability to quickly get the details, along with the rationale behind the details, is the vital link for many projects. Further, when there is knowledge and experience gap, training becomes vital. In recent years Kahl has stepped up in the area of training, providing many equipment and process training events each year. Kahl is dedicated to informing, supporting, training and partnering with the next generation of engineers who will lead the charge in the years ahead. Finally, the industry suppliers, like Kahl, must be there over the long haul. For the industrial space with very long planning cycles and equipment that must operate for decades, having partners who will be there ready to serve is a crucial requirement. Customers and principals understand the value of history and longevity. Kahl has served the market with process and equipment expertise since 1966 and intends to celebrate 100 years in 2066! AMACS is proud to announce a new partnering with Kahl. AMACS is a strong addition to the Kahl refinery turnarounds and maintenance events line up. Since petroleum refineries plan service events four to five years in advance, this type of work fits well with Kahl’s strategy of being a key and vital partner on the requirements continuum. Kahl represents several product categories for the refining space. From those categories needing 4 years planning to those required in the final 4 week scramble leading up to the service event, Kahl has something to offer. The Kahl team sees AMACS tower and separations products as a vital addition to the refining line up. If you need help to safely plan a similar project, call us at 281-716-1179 with your questions, and our team will help you create a plan specific to your process.